You want sammiches? They've got sammiches. 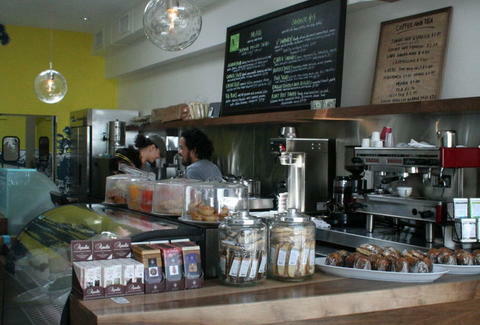 This ultra-casual cafe's got artisan sandwiches (roast beef, turkey, or prosciutto w/ Emmental, mixed greens, balsamic, and olive oil on baguette; grilled chicken and avocado w/ roast tomato pesto, provolone, basil, and herb aioli on herb focaccia), made-to-order coffee from a proprietary 7-bean blend, and shelves stocked with high-end groceries (most locally sourced), including pastas, salts, and small-batch avocado oil, also the name of Popeye's other mistress, who was fat, but, like, the good fat.